With just the flick of a switch, many of us are lucky to have electricity available practically at our fingertips, charging our phones, computers and, dare I say, our lives. Yet, rarely do we take a step back and consider where the electricity we use comes from and whether or not it has any negative environmental impacts. For example, electricity created from hydropower can produce gasses that warm our Earth’s atmosphere such as methane and nitrous oxide. Clean Energy: Is it possible? Atmospheric carbon dioxide (CO2) concentrations are contributed by human activities like the production of electricity. With today’s CO2 concentrations reaching over 410 parts per million (ppm), they continue contributing to the Earth’s warming temperatures through the greenhouse effect: as more CO2 molecules fill the atmosphere, they trap heat from the sun and warm the Earth below it. With increasing concern for the Earth’s changing climate, concerned citizens are straying away from non-renewable energy sources that release CO2 (i.e. the burning of coal, oil, gas) and instead are interested in alternatives such as wind power, solar energy and hydropower. However, when considering other forms of energy, it is important to not only think about the benefits, but we must also be aware of their downsides. Hydropower serves about 28 million residents in the United States and makes up 20% of the electricity used worldwide.1 Water from a reservoir located behind the dam falls under the force of to gravity and through a propeller, also known as a turbine (Figure 1). As the water flows, the turbine spins and powers an electric generator, which ultimately produces electricity. These generators are connected to power lines, providing homes to a constant flow of electricity and as a result, a fully charged iPhone. Since hydropower does not emit CO2, it is praised for being a “clean energy source”. However, a recent study found that sediments behind the dam can produce other, more potent greenhouse gasses, such as methane (CH4) and nitrous oxide (N2O). Carbon dioxide, methane (CH4) and nitrous oxide (N2O) are the three most common greenhouse gases (GHG) contributing to global warming. CO2 is the GHG most responsible for global warming, with global emissions from all human activities reaching a record of 45 billion tons in 2017, averaging about 2.57 million pounds of carbon dioxide being emitted every second.3 In 2016, CO2 accounted for 81% of all U.S. GHG emissions, CH4 accounts for 10% and N2O for 6% (Figure 2). Methane and N2O can be created from the production and transport of fossil fuels as well as agriculture practices and the decay of waste in landfills.4 Although, their total emissions are relatively small compared to CO2, it is important to note that a single methane molecule is 34 times more potent than CO2 as a heat-trapping gas and N2O is a whopping 298 times more potent!5 In other words, even a small amount of these gases in our atmosphere can have significant warming potential. Even if hydropower may not be a source of CO2, it still can contribute to global warming through the production of CH4 and N2O. To better understand how much CH4 and N2O can be produced from sediments behind a dam, Descloux et al. (2017) measured the changes in GHG concentrations from the Eguzon Reservoir in France every month for a year in 2011.6 The Eguzon Reservoir receives inputs of excess nutrients from the agricultural watershed, which support phytoplankton blooms that eventually die and find their way to the sediment surface. As the phytoplankton decompose, the bottom waters of the reservoir become low in oxygen. These conditions are ideal for CH4– and N2O-producing microbes, which release the gases into the overlying water (Figure 3). As the bottom water moves through the turbines in the dam, the CH4 and N2O gases bubble out and are released into the atmosphere along with their heat-trapping potential. Alternatively, some of these gas molecules diffuse out of the water column and into the air. Figure 3: Nitrogen runoff from land enters the water in the reservoir and provides nutrients for phytoplankton. As the phytoplankton decompose, there is a consumption of oxygen creating low oxygenated sediments. In these conditions, microbes are able to produce methane and nitrous oxide. These gasses are then released into the overlying water. Descloux et al. found that higher CH4 and N2O fluxes were recorded in the summer when the nitrogen input and subsequently the deposition of organic material were the highest. Overall, CH4 emissions were three times greater than those of N2O over the year. Ultimately, researchers can agree that although hydropower does not produce CO2, it still can contribute to human caused GHG emissions. 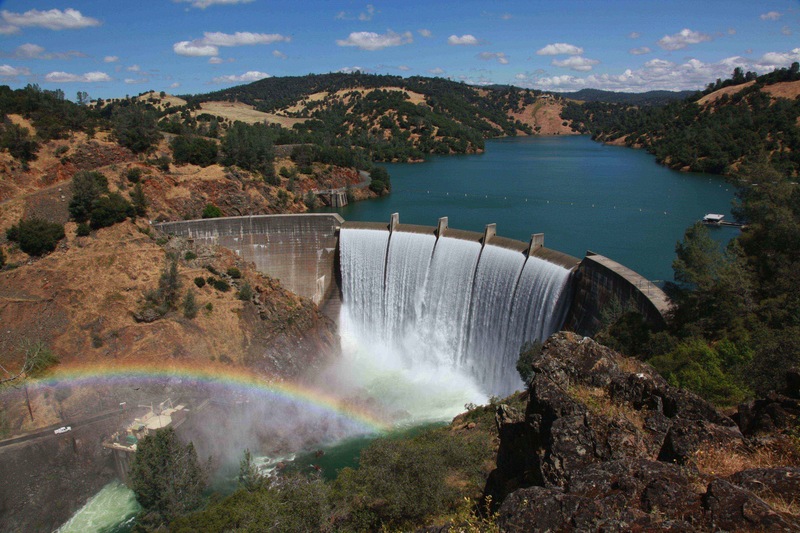 It is difficult to state whether or not hydropower is the best solution to a greener future. Currently China, Brazil and Canada produce the most hydroelectric power in an effort to reduce their dependence on nonrenewable resources.7 Yet CH4 and N2O production from hydropower is not accounted for in yearly GHG budgets. The hope is that studies like the one conducted by Descloux et al. could highlight the significance of this problem. Their findings as well as similar future research could force managers to come up with strategies that are a part of climate change mitigation plans for dams like the one forming the Eguzon Resevoir. Myhre, G., Shindell, D., Bréon, F. M., Collins, W., Fuglestvedt, J., Huang, J., … & Nakajima, T. (2013). Climate change 2013: the physical science basis. Contribution of Working Group I to the Fifth Assessment Report of the Intergovernmental Panel on Climate Change. , Tignor, M., Allen, SK, Boschung, J., Nauels, A., Xia, Y., Bex, V., and Midgley, PM, Cambridge University Press Cambridge, United Kingdom and New York, NY, USA. Descloux, S., Chanudet, V., Serça, D., & Guérin, F. (2017). Methane and nitrous oxide annual emissions from an old eutrophic temperate reservoir. Science of the Total Environment, 598, 959-972.